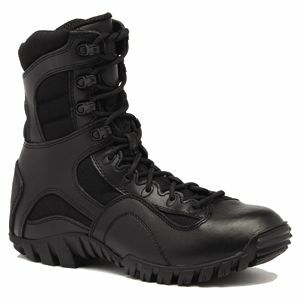 The Tactical Research TR960 KHYBER Boot is a lightweight hybrid boot designed for military, tactical users, and law enforcement looking for high performance, comfort, and durability. This boot features a contoured footbed for a low-profile fit and feel which increases agility and stealth. The upper is constructed of 100% cowhide smooth leather and abrasion resistant nylon. Aggressive lugs aid in quick direction turns, crawling, and rope rappelling. Air mesh ensures your feet are kept cool all day long. A moisture wicking lining brings eliminates wet and sweaty feet even after extended wear. The TR-1 insole provides an orthotic fit with extra padding to reduce shock on your ankles and knees. The TR960 is built tough to maximize your performance while providing first class comfort that will keep you always ready for your next mission. These boots are really comfortable and so far I have nothing bad to say. This is my first pair of Tactical Research. I've owned Belleville in the past and have been very satisfied. The TR line is Belleville's value line and are made overseas (China). But the quality of these are still excellent. I am writing this review after owning them for 3 months. First off, the break in time was minimal, maybe a day or two at most. They are durable and I've run in them with no problems. The foot support is good. No aches or foot pain. I'm definitely impressed by these and I've recommended them to a few coworkers already. These Khyber boots are true to the Belleville name. Worn the Khybers for 4-5 months now with no stitching coming apart or leather peeling. They fit perfect after ordering my regular shoe size. The sole underneath has worn a little, mostly on the heel but they grip real well especially on pavement. I'm very happy with these boot. I'll plan to buy these again as long as they hold together. If you wear wool boot socks these boots are more breathable than you might think. These boots do well at keeping water out to a reasonable extent. I can't speak for them in terms of durability since I've had them for 2 weeks now, but I am surprised at how comfortable they are right out of the box. Been wearing them worn for 12-14 hours in ninety plus weather and no problem. They look great with a coat of light polish. Highly recommended.